Free PC oscilloscope - Is it possible? This article has been so popular that I've written a whole book about it. The book shows you exactly how you can build the scope into a nice enclosure so that you can conveniently use it on all of your projects. The oscilloscope is the single most useful piece of electronic test equipment but it took me years to save up for one. It was a very expensive item back in the 1960's. The most inexpensive yet usable PC based oscilloscope that I've come across is the Hantek 6022BE USB scope. It isn't perfect but it is incredible value for money and great for the hobbyist or anyone that has need for a small portable scope. If you can't afford to buy even the cheapest scope available then try building one for yourself by following this project. It won't do as much as the USB oscilloscope but it will cost you very little to construct. You are so lucky to live in a time where personal computers are so readily available. I'm betting that you either have one of your own already or you have the use of one fairly readily. If you are still at school then you need one for your homework right? If you are not in school then you need a PC to do pretty much everything there is. I am going to show you in this project how you can build yourself a very inexpensive add-on for your PC that will turn it into a very simple but useful oscilloscope. To keep the cost down to rock bottom I am going to present the simplest PC based scope probe that you can imagine. I made mine using parts from my electronics junk box so to me it comes for free. 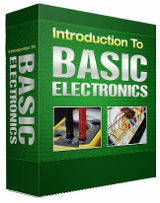 Don't worry if you don't have a junk box, you soon will do if you start building electronics projects. So what's the catch? You can't build an oscilloscope for free can you? Well yes you can pretty much. Just so long as you accept that there will be limitations. You are not going to get the same capabilities that you might expect if you went out and spent good money on test gear but if you can't afford to do that and you have no other way of looking at electrical signals produced by your circuits then this project might work magic for you. The limitations of the sound card oscilloscope are mainly the microphone or audio line input of the sound card that comes with your PC. This means that it will only be capable of displaying relatively slowly moving low frequency signals and the input levels must be kept very low. Audio sound cards are designed for handling audio surprisingly enough. To handle that job effectively they only need to have a bandwidth of 20kHz because that is the limit of the human ear. Most people can not hear anything at all past that point even if some animals are able to. Also the microphone input is only designed for a 10mV input signal so we must try to keep the input levels low. If you have an audio line in input then you should try and use that instead as it will tolerate a higher 100mV input level. Not all PC sound cards have stereo audio inputs. 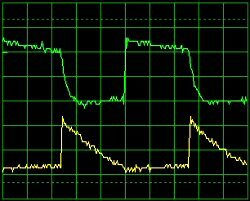 If your computer only has mono input then you will only be able to display one signal on your oscilloscope. If you have a stereo input then you will be able to simultaneously display two input signals which is a very useful feature. I found several software applications that can be used to turn your PC into an oscilloscope and I opted for a free one. Not only will this software turn your computer into a twin beam oscilloscope it will also provide an FFT analysis of the signals too.